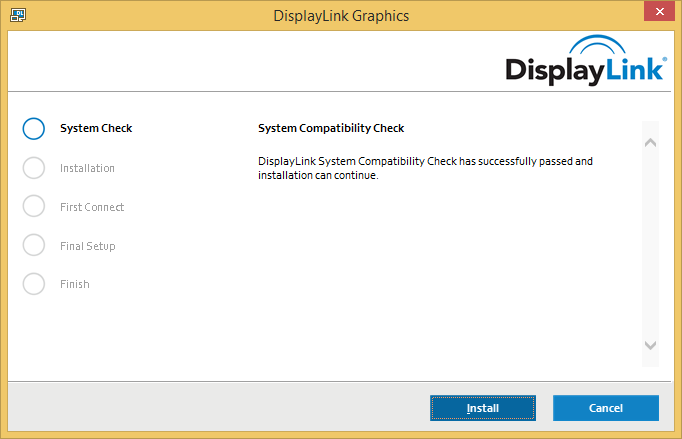 DisplayLink software can be installed from Windows Update. 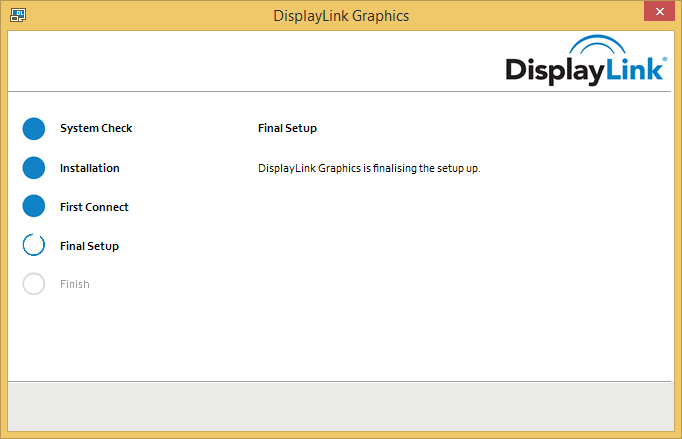 Alternatively, the software can be downloaded and installed from the DisplayLink website following the steps below. Double click on the DisplayLink executable, eg DisplayLink_RX.X.exe. The Windows User Account Control window opens (if enabled in the OS). Click Yes. 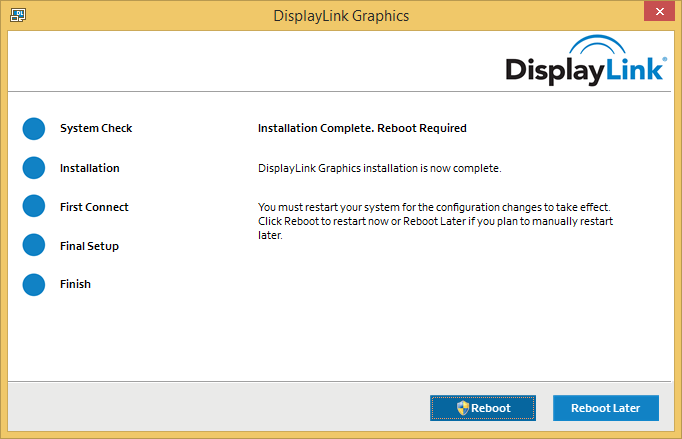 DisplayLink Core Software installs. The System Compatibility Check then runs. Click Install (if the System Compatibility Check passes). If the System Compatibility Check does not pass (see below for an example) please see this article for more information. Reboot your PC to complete the installation. DisplayLink software can be downloaded and installed from the DisplayLink website following the steps below. If the System Compatibility Check passes, click "Install" to continue with the installation. If the System Compatibility Check does not pass click the "More Information" link to open a relevant knowledgebase article. 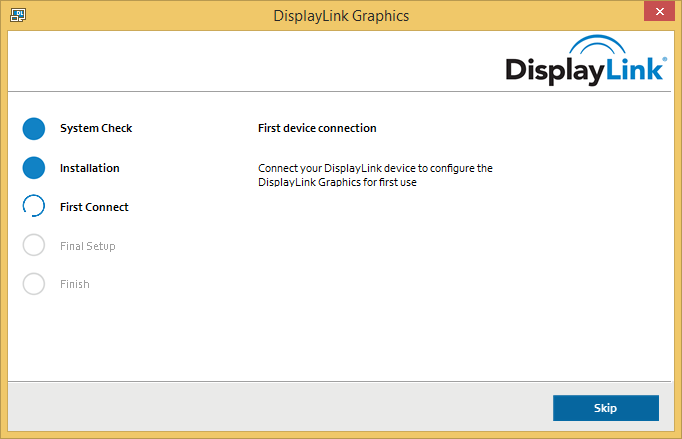 Upon detection of a DisplayLink enabled device DisplayLink Core Software is configured for first use. Select the 'DisplayLink Software Installer' to begin installation of the DisplayLink driver on your Mac. Please refer to this article about the system requirements and how to install on Android from the Google Play Store. 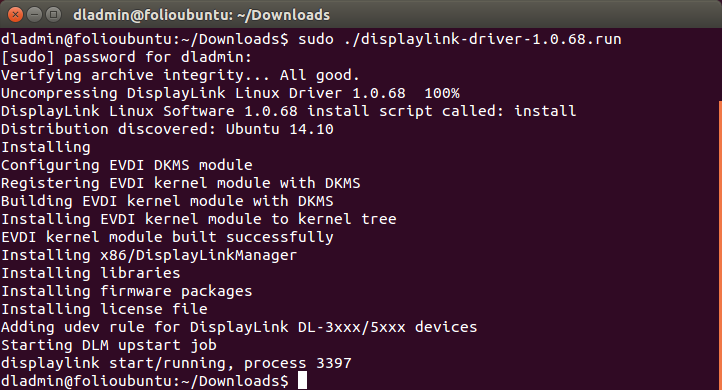 The latest software for Ubuntu 14.04.2 LTS can be downloaded from the DisplayLink website. This will download a .zip file. IMPORTANT: Make sure your Ubuntu distibution is up to date by running sudo apt-get update and then sudo apt-get dist-upgrade from a Terminal. If the distribution is not up to date, you may find issues with blank or corrupted USB displays. Extract the .run file from the .zip file. Make the .run file executable by right clicking on the file and choose "Properties". Check the "Allow executing file as a program" box. 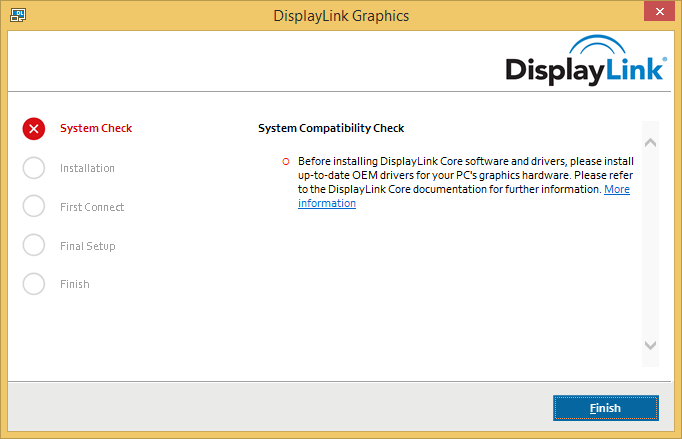 The DisplayLink software should install as shown below. Note: The DisplayLink .run file just provides support for the video outputs. Audio and Ethernet support are provided by the native Ubuntu drivers.